Since its inception, Camsa has been actively involved with the Halifax Region. It’s something we feel is important and it is an integral part of our core values. We have been proud to support organizations such as Parker Street Food & Furniture Bank, Children’s Wish Foundation, Junior Achievement of Nova Scotia, Export Achievement Awards, Phoenix House, Alice Housing, Canadian Red Cross, Maritime Philanthropy Awards, Bridgeway Academy and Unicef Canada. In 2015, Camsa initiated our very own charitable organization with a unique fund raiser to support local charitable initiatives. This initiative – Captains and Cooks (www.captainsandcooks.ca) will continue as an annual fundraiser. The inaugural event was in support of Phoenix Prevention Services – a community based organization located in Halifax that offers an innovative continuum of care designed to address the needs of youth. Camsa employees also generously donate their time and effort to help make a difference. Throughout the year, they fundraise for various charities via 50-50 draws, casual Fridays, bake sales, flower sales and door-to-door collections. You can see a few examples below. On October 3 – 4, Local High School students achieved a unique first in Halifax! They managed to convince Halifax administration to allow them to hold the 3rd Cold Campout on a municipal park in the centre of the city! 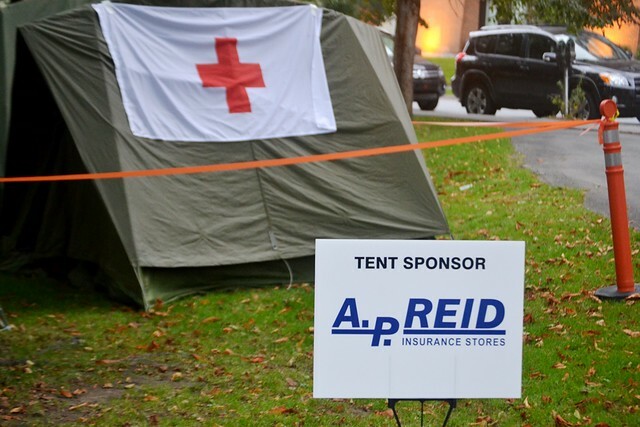 Over the last 3 years of this event, over $150,000 for the Atlantic Canada chapter of the Canadian Red Cross. Halifax – On November 8, 2013, Maple Trade Finance staff members and guests were delighted to attend the magical Alice in Wonderland themed evening: Alice through the Looking Glass. The event was a huge success, raising over $50,000 for Alice Housing who has been providing safe and affordable housing for women and their children leaving domestic violence. To commemorate their 30th anniversary, Alice Housing recognized 30 individuals and key community organizations that have contributed to their growth and success, among which was our very own Carole-Ann Miller. Halifax – On September 21, 2012, MTF was among 120 local business leaders who were banished to the Garrison Grounds. For the second consecutive year they took part in Exile Island, a unique fundraising adventure in support of Children’s Wish Foundation. Prior to the competition, MTF used their “wax on, wax off” techniques for the benefit car wash, their extraordinary culinary talents for the bake sale, and a little bit of luck (50/50 draw) to raise money. Including the generous donations from the business community, friends, and family, MTF was able to raise $14,500. The Halifax event generated over $190,000 in donations and pledges. This money will enable numerous children living with a life-threatening illness the opportunity to receive their wish. On September 7, 2012, the Cornwallis House lobby turned into a temporary baking store. It was hard to resist the wide selection of delicious homemade treats. On September 16, 2012, the Sackville Fire Station #10 graciously donated their time and equipment to help our benefit car wash.
July 11, 2012 – Our staff did their best Vanna White impersonation to show off MTF’s logo on part of Parker Street’s fleet. Parker Street is a not-for-profit organization that provides food, furniture, professional skill development, mentoring and support services to residents of Halifax Regional Municipality. The Children’s Wish Foundation is a very special charity that is near and dear to the hearts of MTF’s employees. Family and friends were also touched by the cause and kindly helped us reach our goal. Our fundraising efforts started on September 18, 2011, by using some muscle power during a car wash at a Petro Canada on Kearny Lake Road in Halifax. Earlier that day, David Angot and his daughter Marissa played violin on the boardwalk in downtown Halifax. On September 23, 2011, MTF attended the Exile Island pledge raising event, which is based on the reality show Survivors. Exiled tribes, comprised of local business leaders, were armed only with their personal communication devices to compete in raising money. Three courageous women from MTF did some serious sweating for a good cause on March 26, 2011, during the Bust a Move fundraising event for breast health. Everyone from the office worked hard at raising close to $6,000, but these three brave souls volunteered to exercise for six hours. The money raised for the event ($863,500) will help retrofit a women’s breast health centre so it can be a one-stop service centre for patients. Everyone knows someone – a family member, a friend or a co-worker-who has been affected by cancer. That’s why we decided to work together in fighting back. Through bake sales, silent auctions, potlucks, and door-to-door fundraising, we were able to raise close to $10,000 for CIBC Run for the Cure from 2006 to 2008.